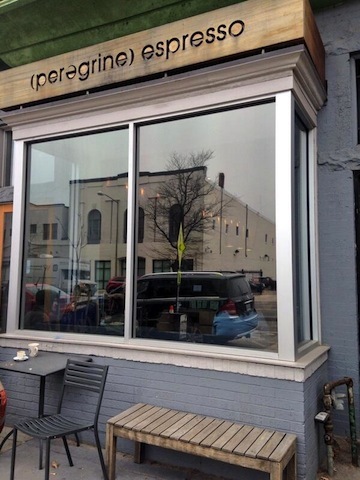 Peregrine Espresso | Gluten Free D.C.
*This post breaks all the rules because a) Peregrine Espresso is a coffee shop and b) the scone is made out-of-house at Buzz Bakery and brought in fresh each morning. BUT, I couldn’t not tell you about this treat. So here it goes. What I got: Gluten-free vanilla fig scone. I can’t stop thinking about this scone. I bought one on my way back from a big brunch last weekend because I have zero will power. It’s a good size, and the texture is close to that of a traditional scone. My brother (who is not gluten-free) has shared it with me more than once, which is the true sign of a good gluten-free product. The coffee is good, too. 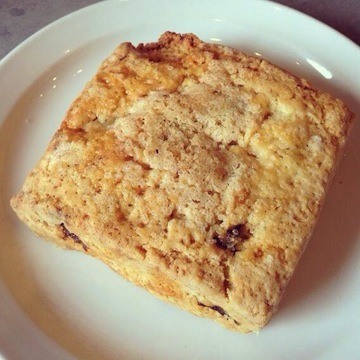 Gluten-free friendliness: The scone is the only gluten-free pastry. (As someone who has trouble making tough decisions about breakfast pastries, though, I’m not complaining.) All the other snacks and desserts available are not gluten-free. Overall vibe: This coffee shop is similar to other pop-up, trendy coffee places in the city. The exposed brick wall gives the small space a warm feeling, but there isn’t much seating. Your best bet is to take the scone and coffee to go. This entry was posted in 14th Street, Eastern Market, Union Market and tagged Buzz Bakery, GFDC, Gluten-free diet, Gluten-free foods, GlutenFreeDC, Pastry, Peregrine Espresso, Scone. Bookmark the permalink.